Eventertainment plays an important role and even helps in shaping the preliminary perceptions and expectations of a special event. If you’re searching for innovative ideas, allow our interactive and fabulously fun Eventertainers to leave a lasting impression on you and your guests. Our Human Strolling Table, also known as Living Table makes a unique meet and greet centerpiece at any corporate or private event. 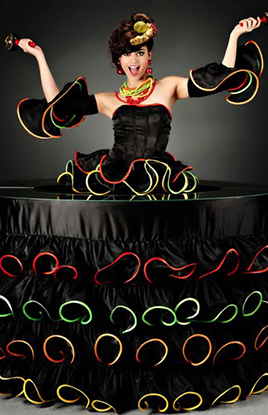 The 4’ or 5’ rolling round table is presented by a beautiful model in the center and dressed in an extravagant costume. The table glides with grace through your gala event and interact with guests while presenting cocktails, appetizers, desserts, party favors, name tags, place cards, promotional materials, and more. Choose from a range of fabulous costumes or color schemes to coordinate with your event. Create an exciting buzz as your guests arrive with our Freeform Greeter, also called Spiral Diva. These performance artists are outfitted in fabric-sculptured costumes that swirl and spin and morph into art in motion. They are fun, sassy, and full of moves! We offer over 40 colors for costuming and digitally printed logos and images are available. Are you having a Casino Royale themed event? Consider our Vegas-inspired Showgirls with their elaborate costumes and feathered headdress for a great photo opportunity for your guests. This is an absolute must for creating an exciting and exclusive ambiance for any occasion. As seen at many Hollywood premiers, the Living Red Carpet makes a memorable impression from the moment your guests arrive. With a mix of glamour and the unexpected, your guests will walk the red carpet before realizing that it is a part of a couture gown worn by an elegantly poised live performer at the opposite end. Now that’s Event-sational! Standing over 8’ tall, our Glam Goddesses have been used at event entrances or placed throughout a cocktail space as living statues. In their dazzling gold or silver costume, they tower among guests creating a stunning architectural structure. We can also provide atmospheric characters for your themed event such as a pirate, body painted model, belly dancer, gladiator, Can-Can, Flamenco dancer, and more. Call us with your ideas and we’ll create a custom costume based on your specifications. All of our Eventertainers will happily pose for photographs with your guests and offer a meet and greet in style. Let us Eventertain you; let us make you smile!